Amplify even fine hair with the juicy duo of island fruit essences in Giovanni 2Chic Tangerine & Papaya Butter Ultra-Volume Amplifying Styling Gel. 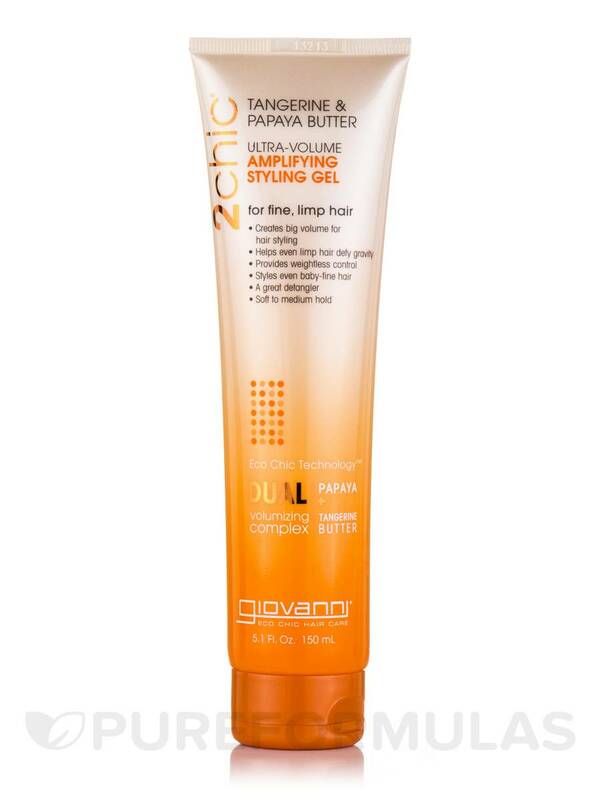 Create maximum volume with Giovanni 2Chic Tangerine & Papaya Butter Ultra-Volume Amplifying Styling Gel - a clarifying blend of juicy tangerine and nourishing buttery papaya. - Creates big volume for hair styling. 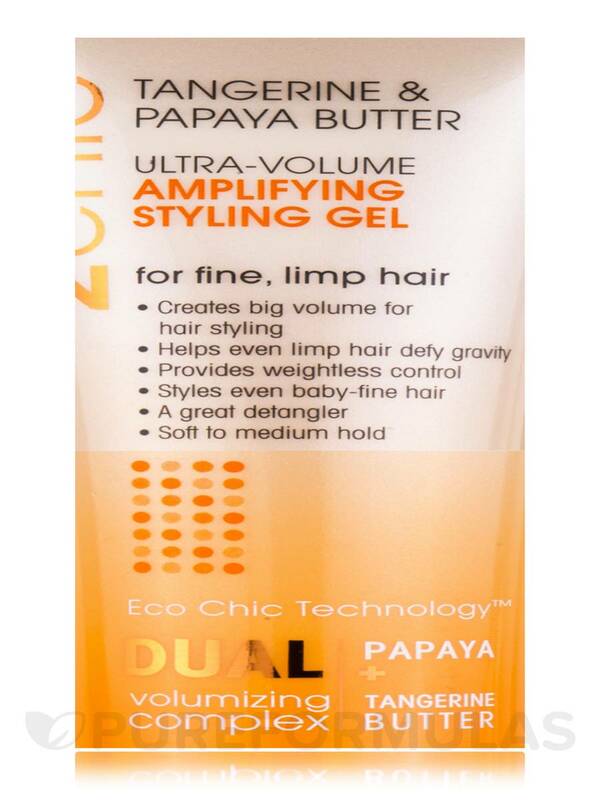 - Helps even limp hair defy gravity. - Styles even baby-fine hair. - Soft to medium hold. Aqua (Purified Water)‚ Glycerin‚ Panthenol (Pro-Vitamin B5)‚ Xanthan Gum‚ Fragrance‚ Dehydroacetic Acid‚ Acrylates Copolymer‚ Carbomer‚ Beta-Carotene‚ Phenoxyethanol‚ Citrus Tangerina (Tangerine) Peel Oil‚ *Carica Papaya (Papaya) Fruit Extract‚ *Panax Ginseng Root Extract‚ *Citrus Grandis (Grapefruit) Fruit Extract‚ *Aloe Barbadensis (Aloe Vera) Leaf Juice‚ *Vanilla Plantifolia Fruit Extract‚ *Saccharum Officinarum (Sugar Cane) Extract‚ *Prunus Amygdalus Dulcis (Sweet Almond) Fruit Extract‚ Annatto. 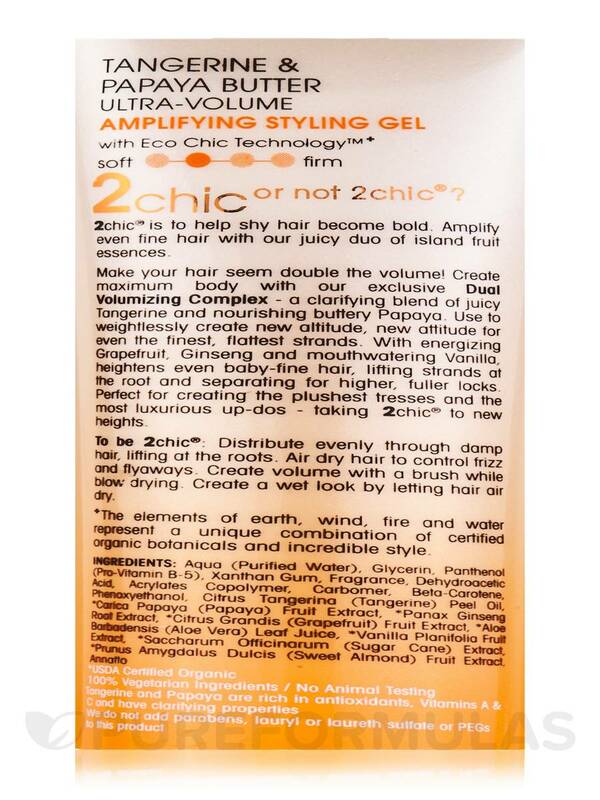 Distribute evenly through damp hair‚ lifting at the roots. 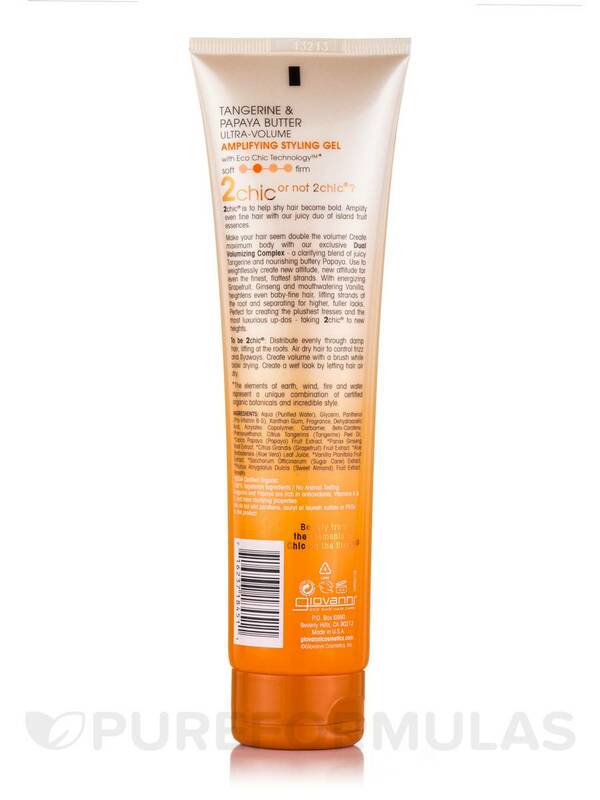 Air dry hair to control frizz and flyaways. Create volume with a brush while blow drying. Crease a wet look by letting hair air dry.